So I haven’t seen a ‘Leprechaun’ movie since… Aw man, I’ve never seen one of those Warwick Davis ‘Leprechaun’ movies though I might have to track back to watch the first one since Jennifer Anniston was in that, and then jump ahead to Leprechaun 6 because Tangi Miller was in that one. I thought my self-imposed Leprechaun movie drought was all but over considering that SyFy was bringing a very special ‘St. Patrick’s Day’ SyFy original to light with ‘Leprechaun’s Revenge’ but gosh darn… Warwick Davis is nowhere around to be seen. No sir, we have a movie that’s completely independent of ‘Leprechaun in Da Hood’ with ‘Leprechauns Revenge’. 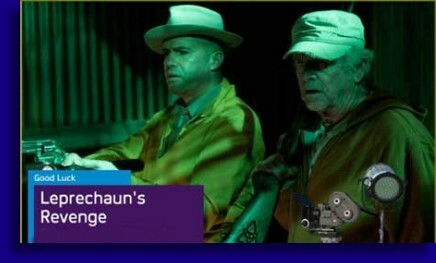 So with Billy Zane and Bill Devane together… at last… I’m thinking we might have a sci-fi original winner here. But I’ve been wrong before. High schooler Karen O’Hara (Courtney Halverson) and her blazing mane of auburn hair is hanging out in the woods with her Gramps (Devane) hunting wild boar. Somewhere along the line the two get separated, Karen stumbles upon an eerily surreal type scene, finds a red four leaf clover and picks it. Bad move Red. Karen is summarily attacked by some hideous, googly eyed gargoyle looking creature, and worse she has an imprint of that red clover burned into hand. Why would this be worse than getting attacked by a gargoyle? Just you wait and see. haunted woods and the weird creatures that hang out in these woods, so we can see why this irresponsible bum would drag his granddaughter to hunt pigs in these haunted woods. Meanwhile our high school chick is having a hard time right now. She’s having horrible nightmares, the clover blister on her hand is getting worse, and thanks to the wonderful Internet she’s learned that she has four days to live. That is unless she can put that Leprechaun back in the dirt where it came from. Say what? Yep, Karen has set the Leprechaun free by picking that clover, and now it’s going about the business of killing people in this town and devouring their gold. Even if the gold is in their teeth. It also helps that Karen’s potential boyfriend is this movie’s exposition guy and is blessed with the gift of reading and puts this gift of his to good use by uncovering all sorts of juicy leprechaun subduing information. The sheriff didn’t want to believe it, his cute deputy (Azure Parsons) didn’t want to believe it, but gramps has been telling them for years… they have a leprechaun problem and it has to be dealt with. Or rather Karen is going to have to deal with it. All I’m saying is don’t get too attached to anybody in this movie who isn’t real thin and has red hair. That’s all. So we’re three months into 2012 and I hate to say it but it hasn’t been a good quarter for my much cherished Sci-Fi original feature film. But of the half dozen or so we’ve seen so far, I think ‘Leprechaun’s Revenge’ might be the best of the lot of Q1, while fully recognizing that this isn’t all that good either. There is a little something strange going on with this one however, and I don’t think I’ve actually ever seen this in a movie before. I mean I’ve seen movies that have adjusted their tone as it goes on, but I don’t think I’ve ever seen a movie that has actually changed genres. You see the first half, or probably even more of this movie, is a traditional horror film, featuring a ghastly creature, jump scares like the old ‘creature running in front of the camera’ trick or the old ‘monster behind the closing refrigerator door’ gag. The monster is eating people, maiming people, and displaying his annoying habit of pulling a character out of a scene and splashing red goo against a nearby wall. Exposition guy is giving us spooky details, the orchestra hits are loud, Bill Devane is chewing scenery and I’m fairly bored. Then about the time the high school kids walk into a long abandoned brewery, we’re talking like twenty plus years of abandonment here, searching for old beer to drink… the movie now becomes a comedy. Or maybe it was when the leprechaun jumped behind the wheel of a Malibu and drove into town. I don’t know when it happened but now Mr. Leprechaun is Mr. Funnyman and has proceeded to kill 98% of the entire cast of this movie with hilarity being the order of the day. Now I’m less bored, but not because this new comedy horror movie is any better than the traditional horror movie that got left behind, but mainly because I’m curious to know how in the hell this happened. It’s like one minute you’re watching ‘Friday the 13th’, and the next minute Jason’s on a Jet Ski swinging his machete at kids trying to parasail with the Benny Hill music playing in the background. It’s like a Don Knotts’ movie or something. It was really weird. 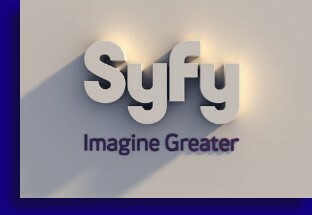 I’ve always been curious what goes on behind the scenes with a movie destined for SyFy, but thanks to this one it’s about to become an obsession. I have got to get on the set of one of these six day shoots and see how it goes down… maybe as a dishwasher or as the film director… one or the other since I’m certain I’ll be completely incompetent in either capacity, but could I really do worse? I think I should be the director because in all honesty would you rather watch a bad movie or eat off of dirty dishes? Right? ‘Leprechaun’s Revenge’ is not a good movie, but you do almost get two movies built in for the price of one. I think that’s worth some kind of kudos.